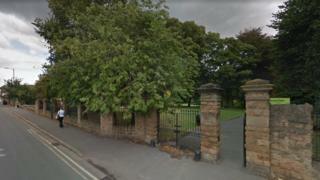 The body of a man has been found in a pond in a Nottingham park, police have said. Officers were called to Vernon Park, in Vernon Avenue, Basford, just before 11:30 GMT. The body was recovered shortly after and inquiries are taking place to establish the identity of the man and circumstances relating to his death. An area of the park has been cordoned off and police have made an appeal for information. Police later said the death was being treated as unexplained but not suspicious.